Mizzou Meat Market is committed to bring you the best, top quality meats. Operated by students in the College of Agriculture, Food and Natural Resources, Mizzou Meat Market combines traditional learning with hands-on, entrepreneurial experience. Mizzou Meat Market, also known as the Don Naumann Muscle Foods Processing Laboratory, serves to support teaching, extension and research activities of the food science and animal science programs at Mizzou. We realize that some folks might be a little leery about buying meat from a research University, but we feel it’s actually a good thing because of the care we are obligated to provide to the animals we keep here. In fact, we think that our meat tastes a little better because our animals are so well cared for. 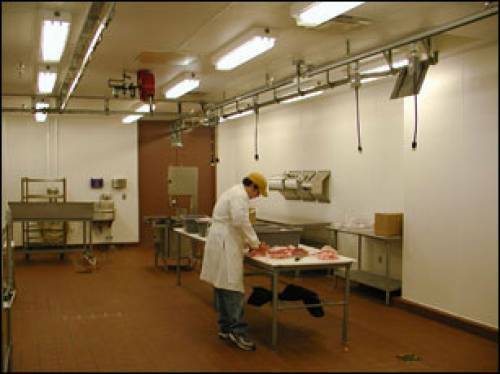 We are extremely careful about the well-being of the animals and how we handle the meat because our meat lab, like every other commercial butcher’s shop, must meet all USDA standards for sanitation and safety. Some of the meat we sell does come from research animals, usually those used as “controls.” But even those that aren’t, are under the watchful eyes of experts, and nothing is done to them that could in any way cause the animal or you any harm. In times of short supply, we occasionally buy meat from other suppliers that meet our high standards of quality and safety. At the Mizzou Meat Market, we are committed to bringing you the best, top quality meats.